I read an interesting article last week about a scientist, Breanna Putman, who’s studying animal fear responses, and she recently published a paper about how the color of your t-shirt can affect how close you can approach a common lizard in southern California, the Western Fence Lizard (photo above). The males of this species have blue patches on their abdomen and throat, so Putnam tested how they responded to four different colors: dark blue, light blue, red, and gray. Interestingly, when she wore dark blue, the lizards let her get on average 100cm closer than when she wore other colors. This supports the theory known as the “species confidence hypothesis” — that animals are less afraid of colors that appear on their bodies. 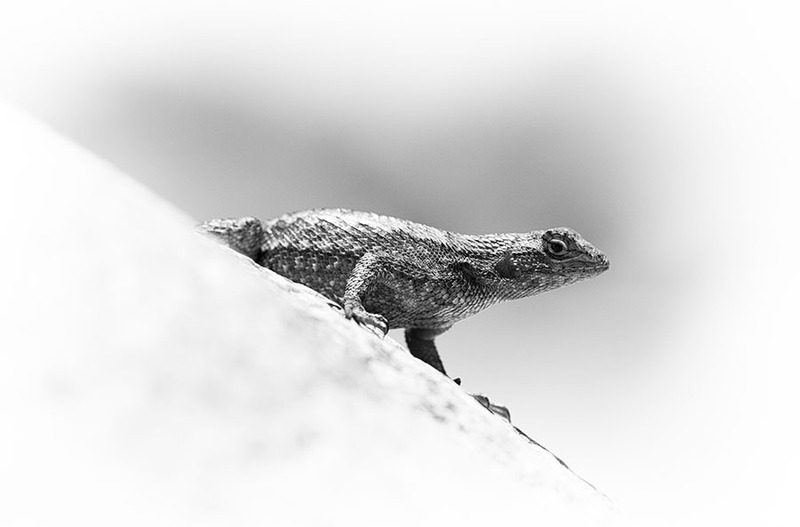 With a small subject like the Western Fence Lizard, that extra 100cm (a little over 3 ft) can help a lot when you’re trying to photograph them. It can be the difference you need to fill the frame with your desired composition. While we’re on the topic of getting close to subjects to photograph, it’s a good reminder to respect all wildlife while photographing them. If you scare your subject away, don’t pursue them — that will only cause more stress on them. Instead, wait and see if they come back to that same spot you scared them from. Sometimes they will, and this time they’ll be much less afraid of you. If they don’t come back, just wait for another opportunity. The animal’s (or plants too!) well-being is always more important than a photo. Thanks for this tip. Even after being on this planet 78 years I learn something new every day. Be safe! And good luck! I hope u don’t get ate. Very interesting! Thanks for this information! Wow this brings about a new way to look at camo clothing. I spend quite a lot of time sneaking up on blue wrens, dressed in camo clothing, even a leaf suit sometimes, perhaps have been looking at this all wrong should be wearing blue, maybe navy camo with if various shades of blue. Will give the blue idea a go next time out looking for blue wrens. Good luck, Denise! Let me know how it goes! I too, had been misinformed, and believed blending in with camo clothing was the way to go. Thanks so much for your article–very helpful. I’m guessing that wearing camo might still be the best strategy for many subjects. It’s probably best to try both, and compare.